Life has returned to normal at Castle Glower after the uproar caused by the recent plot to overthrow the King and Queen. Well, as normal as life can be in a castle where new rooms, hallways and towers appear seemingly at random. 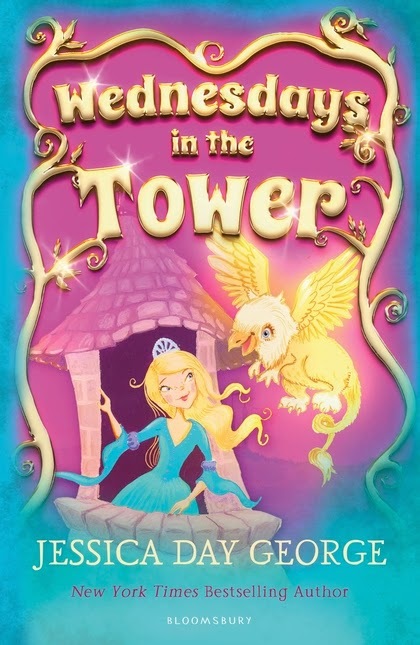 Princess Celie is just getting back into her routine when she stumbles across a new tower that contains a mysterious egg. As the weeks go by, Celie returns to the room to check on the egg, until one day, to her great surprise, it cracks open to reveal a griffin! Can Celie keep this new pet hidden from her family and from the intrusive wizard Arkwright, who seems intent on interfering with all of Celie’s plans to learn more about griffins and the history of Castle Glower? Can she find out why the Castle is suddenly behaving so strangely? What other secrets does the Castle have for her to discover? Wednesdays in the Tower is the wonderful sequel to the fantastic Tuesdays at the Castle (KBR review). I know it sounds like I am gushing, but this really is a great series. A blend of fantasy and adventure, this series is a great option for younger readers looking for more complex themes, plots and conflict with an age-appropriate setting and characters they can relate to. Celie takes centre stage in this book as she takes on the challenge of raising the griffin and piecing together the history of Castle Glower. As she does, she discovers that the Castle’s history is somehow linked with griffins. It seems that the Castle is connected with another place and time. Can they solve the mystery of where the castle came from and why? While the adventure element of this story will appeal to both boys and girls, it is particularly worth noting that Celie is a great strong female protagonist to engage the interest of young girls. I was a little disappointed that the new cover graphics show Celie looking much more Barbie-like than on my copy of Tuesdays at the Castle, but Celie is nevertheless a smart, energetic, brave, determined character. This series has some great plot twists that will keep young readers guessing until the final scenes. Wednesdays in the Tower finishes with a cliffhanger ending that will hopefully be resolved in the third book in the series, Thursdays with the Crown, which is due to be published in late 2014.